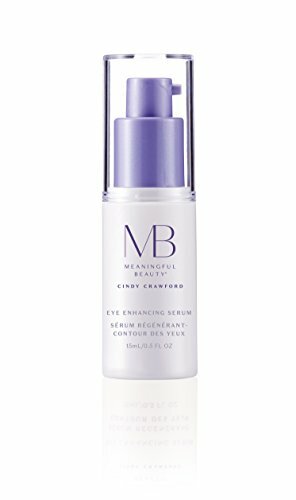 Now you can combat look of puffiness, dark circles and fine lines with Meaningful Beauty Eye Enhancing Serum. Wrinkles and fine lines visibly improve with regular use of this refreshing serum. Its enriched formula fights the visible signs of aging while combating free radicals. It improves your skin’s ability to retain moisture, improving overall hydration, so your eyes look fresher. Ingredients:Water (Aqua), Cyclopentasiloxane, Dimethicone, Pentaerythrityl Tetracaprylate/Tetracaprate, Cetyl Alcohol, Dimethicone Crosspolymer, Hydrogenated Coco-Glycerides, Cyclohexasiloxane, PEG-100 Stearate, Glyceryl Stearate, Cucumis Melo (Melon) Fruit Extract, Hydrolyzed Kluyveromyces Extract, Cassia Angustifolia Seed Polysaccharide, Dipeptide-4, Glutamylamidoethyl Indole, Hydrogenated Vegetable Oil, Ethylhexylglycerin, Butylene Glycol, Caprylyl Glycol, Hexylene Glycol, Xanthan Gum, Stearic Acid, Disodium EDTA, PEG-75 Stearate, Ceteth-20, Steareth-20, Phenoxyethanol. If you have any questions about this product by Meaningful Beauty, contact us by completing and submitting the form below. If you are looking for a specif part number, please include it with your message.